In forest clearings, beneath star-filled skies, in cathedrals, and before the hearth... women and men have always given voice to the impulse to celebrate the world that surrounds and sustains them. Now, as we face a diminished present and an uncertain future, the need to honour the interconnection between people and the planet is heightened. Earth prayer begins with our intuition of the oneness of all life. We recognize that our identity is inextricably entwined with lives beyond our own. This sense of expanded identity goes beyond human relationships, We depend upon trees, trees depend upon grasses, grasses depend upon animals, mountains depend upon oceans, the dolphin depends upon the farthest star. Physically and spiritually, we all are woven into the living processes of the Earth. We take part in—as science now tells us—a planet-sized living system. Our breathing, our acting, our thinking arise in interaction with our shared world. Our own hearts constantly beat out the cosmic rhythm within us. We cannot escape our involvement any more than we can escape breathing the air that has traveled from plants thousands of miles away. When we ground our spiritual awareness in this ecological context, then the strength and wisdom of the living Earth, in all its manifestations, flows through us. Our Earth Prayer becomes a means of acting upon ourselves. It helps us to empty the self and to open our hearts to be filled with empathy and creativity. open, the door of compassion. These prayers seek to heal the division that has grown between us and the rest of nature. They tell us: Pay attention. Attend to the relationships alive among all forms of life. Use imagination to explore the binding curve that joins us together. Seek to know the other. Join with it. Care for it as for yourself. When the human spirit is understood in this sense, as the mode of consciousness in which we are connected to the planet as a whole, it becomes clear that our entire life is an Earth Prayer. 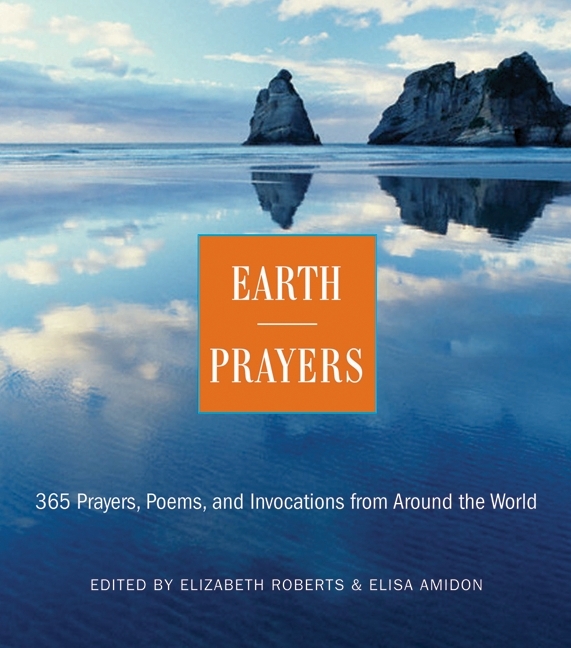 "An exquisite and powerful harvest, this truly a Book of Common Prayer for our planet's people in this time." In forest clearings, beneath star-filled skies, in cathedrals, and before the hearth... women and men have always given voice to the impulse to celebrate the world that surrounds and sustains them. Now, as we face a diminished present and an uncertain future, the need to honor the interconnection between people and the planet is heightened. From Walt Whitman, Thich Nhat Hanh, and Black Elk, to Margaret Atwood, the Rig Veda, and the chant of a Samar fisherman, the varied voices linked here offer songs and prayers for land, sea, and air; graces for food; and invocations, poems, and passages that reveal in the common spiritual heritage of all who cherish creation.